The keto diet was the No. 1 searched diet on Google in 2018. Keto pancakes and keto cheesecake were the fourth- and fifth-ranked food search terms. But as the diet’s popularity has increased, so has the controversy surrounding it. It all begins with very low carbs. A normal diet consists of about 300 grams of carbohydrates every day, but for people on the keto diet, about 20 grams is the limit. The low-carb intake is replaced with a high consumption of fats. It’s similar to the Atkins diet, which was popular in the early 2000s. When carbohydrates are restricted, the body turns to glycogen, a backup carbohydrate stored in the liver, for energy. When this supply of glycogen is depleted, the liver produces ketones for energy, a process known as ketosis, according to the Mayo Clinic. For people on the keto diet, the goal is to be in a constant state of ketosis, where instead of storing fats the body burns them. Elizabeth Parks, a professor of nutrition and exercise physiology in the University of Missouri’s School of Medicine, said the keto diet is sustainable and the criticism is often misguided. Adam Whaley-Connell, professor of medicine in the division of nephrology and hypertension in the School of Medicine and associate chief of staff at Truman Veterans’ Hospital, said while the short-term gains from a ketogenic diet are great for weight loss, the long-term effects can pose increased risks to the heart and kidneys. “As a physician, I routinely tell people that these types of high-fat diets can have different implications for your health that may not be in your favor,” he said. Six months after the birth of her second child, Breland wasn’t happy. As a former college volleyball player, she wasn’t used to feeling out of shape. A friend introduced Breland, 29, to a keto drink supplement, and she decided to give it a go, hoping it would help her lose weight and feel healthier. After three months of drinking the supplement and changing to a low-carb diet, she decided to go full keto. She didn’t weigh herself, but she dropped from a size 6 to a 2 or 1 in the first three months, she said. Breland begins her day drinking a ketogenic supplement that suppresses her hunger and helps her body stay in ketosis. She only eats between 1 p.m. and 7:30 p.m. For lunch and dinner, she sticks with leafy greens and meats, like a salad and a hamburger without a bun. It all adds up to about 1,400 calories per day, and she’s now focusing on gaining muscle. Breland said she has never been in better shape physically or mentally. Breland works out five days a week for 35 minutes during her lunch hour. Before going on the keto diet, she occasionally exercised and ate an unlimited amount of carbohydrates and sugars. 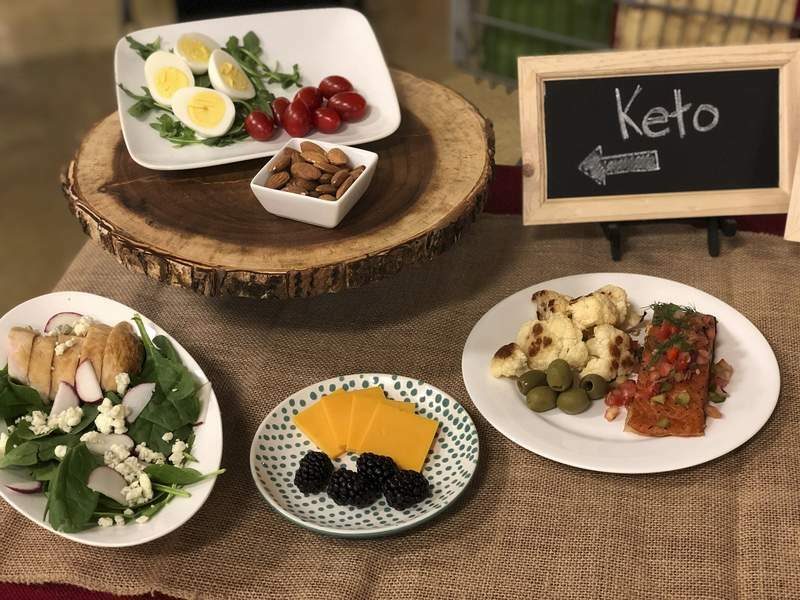 Ashley Ritzo, a clinical dietitian for University of Missouri Health, typically does not recommend the keto diet to her patients. Her recommendations are based on the sustainability of the diet. “My philosophy on nutrition is to commit only to changes you can do for the rest of your life,” she said. For someone to sustain a ketogenic diet and maintain good health, they must be committed to including plant-based fats like avocados and nuts in their diet, she said. “One of the problems is that some people end up eating too much of animal-based fats, like bacon,” she said. Whaley-Connell said research shows that high-fat diets in general can have negative health effects in the long-term, regardless of whether the fat comes from plants or animals. Cardiovascular risks such as heart disease, stroke and high blood pressure can increase over time with a high-fat diet, he said. That’s why going on the keto diet under the supervision of a physician is important, he said. But he won’t recommend it to his patients and explains that the long-term health risks outweigh the short-term weight loss results. Parks is less persuaded by those risks. For her patients on low-carb diets, she recommends taking multivitamins, and making sure vitamin C is being replenished. Drinking plenty of water is important, as carbohydrates often supply most of the body’s hydration, she said. “Many people ask what the minimum amount of carbs you need a day is, which is controversial, but it’s important to realize that your liver can supply the body with energy in other ways when on low-carb,” she said. The hardest part of the keto diet for Breland is the negativity and criticism that surrounds the lifestyle. “The lifestyle isn’t for everyone, but for me, it is sustainable long-term,” she said. Losing water weight: Glycogen, the backup carbohydrate in the liver, is stored with water. During ketosis, glycogen becomes depleted and thus water is not being stored. Less sugar means less stored fat: Sugar is a carb, and the carb intake on the ketogenic diet is very low. When fat is consumed with sugar, the body uses the sugar as fuel and stores the fat. When fat is consumed without sugar, the body burns the fat instead. Cutting carbs means cutting calories: When a diet is restricted by something as common as carbohydrates, fewer food options are available to the person. With fewer food choices, people eat less. For Breland, the lifestyle change came at no additional expense and was an easy transition, even with meals to prepare for two kids and a husband. “When I cook for my family, I just modify it for me,” she said. “If my family has tacos, I have a taco bowl.